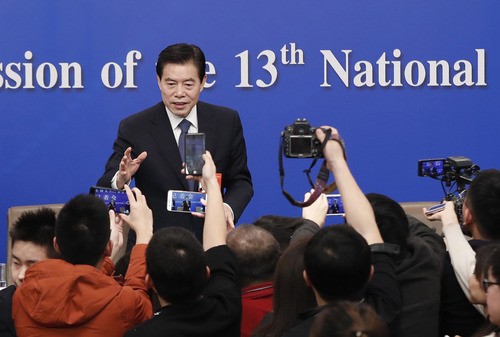 China will take a string of measures to promote stable and higher quality growth of foreign trade this year, said Zhong Shan, China’s Minister of Commerce at a press conference for the second session of the 13th National People’s Congress (NPC) on March 9. The minister hailed China’s trade performance in 2018 as the country expanded the scale and improved quality of foreign trade despite complicated situations, uncertainties and instability. China’s total exports and imports hit a historical high of $4.62 trillion last year, reporting an increment of over $510 billion from a year ago. The performance further consolidated China’s position as the world’s largest trading country and accelerated its transformation to a trader of quality, added Zhong. He told the press conference that the Ministry of Commerce would follow the requirements raised by this year’s government work report to seek stable, better-structured imports and exports. The country will make efforts to stabilize foreign trade growth and market, Zhong noted, elaborating that a raft of central policies and measures in export credit insurance, financing, and trade facilitation will be implemented to reduce burdens and improve efficiency for foreign trade companies. He added that efforts will also be stepped up in improving the business environment for market entities, including state-owned enterprises, foreign companies and private firms, to shore up confidence and stimulate vitality. China will promote international cooperation via the Belt and Road Initiative and optimize the layout of the international market as the market is crucial for trade growth, Zhong noted, adding that it will explore emerging trade markets while building on traditional ones. The ministry will encourage exports of high-tech, high-quality and high-value-added products to improve their competitiveness in the global value chain, Zhong said. He praised China’s efforts in this regard by citing an example of the auto industry. Five years ago, the China-manufactured passenger vehicles, especially the small models, were exported at low prices and small quantities, but thanks to thehardwork, some makers have earned high reputation and quality awards from the international community. Besides, the minister stressed that imports will be expanded in scale and optimized in structure to meet domestic demands. Zhong also vowed that the ministry will support enterprises’ innovation in technologies, systems and management, and encourage the development of new trade businesses and models, so as to boost market competitiveness and facilitate China’s transformation from a trader of quantity to a trader of quality. Innovation is the primary propeller of development, as well as a source of power for foreign trade progress, he explained.